Photos by Becky Vinz What is all that? John Plankinton’s statue dominates the central rotunda of the Plankinton building in the Grand Avenue Mall. A walk down the curved staircase brings me to the cozy studios of WUWM. I am here to talk with Amanda Shalhoub about “The Deuce.” What is all that? John Plankinton’s statue dominates the central rotunda of the Plankinton building in the Grand Avenue Mall. A walk down the curved staircase brings me to the cozy studios of WUWM. I am here to talk with Amanda Shalhoub about “The Deuce.” You are probably familiar with WUWM, UW-Milwaukee’s FM station and our local National Public Radio affiliate. Maybe you’re a regular NPR news listener. Or you may enjoy the special programming on WUWM: Lake Effect; Fresh Air; The Story; This American Life; Speaking of Faith; Café Tonight; It’s Alright Ma, It’s Only Music; Car Talk and more. This is a remarkable line-up of programming. WUWM is always my first choice on the radio dial. But the “2” thing, the Deuce? What’s that? HD radio is confusing to many. When I bring it up, people say, “But there’s no picture”. High definition TV is fixed in their brains. HD radio is something else – it’s a different way to get radio broadcasts. It’s digital radio. Unlike TV, radio stations are not going to stop broadcasting in their old format – the format used since Marconi discovered radio waves and analog signals were developed in the early 20th century. So why HD radio? HD radio provides static-free listening on both the AM and FM broadcast bands and allows for expanded programming. Thus WUWM 2. You can listen on line at wuwm.com. Just look for the HD-2 link on the home page. As I am typing this, the Bodeans’ “Fade Away” is playing, followed by Little Feat’s “Rock and Roll Doctor.” I love Little Feat. I don’t think I can hear them on any other radio station. At this time most listeners of The Deuce are online. What is missing with this new technology is a broad listening base with the new equipment that can translate both standard and HD radio broadcasts. Listening on a computer is OK, but I don’t have super speakers on my computer. Carmakers are just beginning to offer HD radio receivers in new cars. I do have a couple of tabletop HD radios and a receiver I plug into my home audio system. HD radio reception in Milwaukee seems good for the digital signal on either the AM or FM bands. This may be a better way to listen to sports on the AM band, the sound is noticeably better than standard AM broadcast. The improvement of the broadcast sound quality is a nice bonus despite what audiophiles may say for or against HD FM radio sound. The real bonus for me is the additional programming. And it is free after you invest in the equipment. Public radio in Wisconsin and WUWM in Milwaukee are leaders in HD radio programming. So let’s talk about programming on UWM HD-2. This brings us back to Amanda Shaloub. We sit in the broadcast booth in comfortable chaires. Shaloub, an attractive twenty-something, dons the big earmuff headphones and talks into an oversized mic that radio studios use. She seems completely comfortable in this environment as we talked and MATC photo intern Becky Vinz snapped photos. Shaloub is responsible for programming on The Deuce as the assistant program director under seasoned director Bruce White. 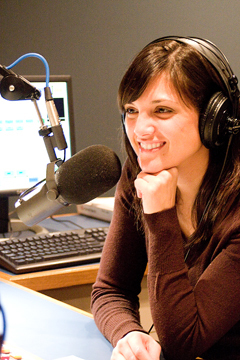 She has been at the station for six years after starting as an intern in Mass Communication and Journalism at UWM. She moved to Colorado for a year to work at a public radio station there, then returned to Milwaukee and WUWM in 2003. Besides programming The Deuce, which she estimates takes up about half of her time, she also hosts the nightly music show Café Tonight on WUWM and WUWM HD-1. Shaloub says the target audience for The Deuce is NPR News listeners. Who is that? Males. Baby boomers. That would be me. She is quick to point out that they want to expand that base for this 24/7 music station to include a younger audience. Maybe she was noticing my mop of gray hair. The future always belongs to the young. When she took this job she thought: “Why not KISS (WXSS) or some other cool station?” But now she feels she is on the coolest station. I have to agree and I do find her music selections exciting and entertaining, though never jarring The Deuce can lead you into new areas of music by new artists and old. And it’s easy to see who the artists are, either online or on the new radios that display the artists’ names and song titles. What music does Shaloub like? Consider the following off the top of her head: Coner Oberst, whose song Sausalito I remember hearing on 89.7-2 and liked, and might be described as a folky indie rocker. TV on the Radio, from Brooklyn NY, whose music is called triphop, rhythm and jazzy cool sound. Ben Harper, from California, with the band Relentless 7, doing covers with a rocking blues note. Local musicians and groups on tour are included in programming by Shaloub. She mentioned a live interview and performance from the studio featuring an Iowa band, She Swings, She Sways that were featured before performing at Stonefly in Riverwest this January. Also mentioned was local acoustic artist Matthew Davies who was featured on Linneman’s Riverwest Inn stage during a recent Wednesday acoustic night open mic performance. A half hour of programming from Tuesday May, 19 included the following artists: Michael Stipe, Coldplay, David Gray, Shawn Colvin, Jim White, Static, Robinella, South, Andrew Bird, Effigy. Some familiar, some new ground for most. I have never heard any repeats during my listening during the same day. It really is music 24/7 with few interruptions. If you need the news it is only a click away, or jump back on 89.7 WUWM’s main station. Remember this is free radio, not satellite or subscription radio. You can have it at home or in your car with the right equipment. Shaloub thinks that more car radios will help solidify the future of HD Radio. Amanda Shaloub seems to have found her niche. She likes her job and likes to make a difference in the community. In particular she sees WUWM and The Deuce’s role as “reaching out to the artists and making a relationship.” I hope that The Deuce expands its WUWM coverage of local musicians and the Milwaukee music scene. If you know of good local performers or to comment on the programming send your suggestions to Amanda. Just go to WUWM’s web site, click on the link to the HD-2 page and find “Contacts Where to Buy HD Radios by Vince Bushell Right now the best place to find an HD Radio is online. I purchased a table top HD radio from Radio Shack and a second one online. Both work fine, but our local Radio Shack does not carry them now. NOTE: Radio Shack does have a HD table radio in stock as of June 5, 2009. I purchased a HD tuner for my home stereo from the Sony store online. If you are interested search online for “HD Radios”. Ebay has a number of units from various makers and may be the best bet at this time to get a new or refurbished unit at a good price. You should be able to buy a table top radio for $100 to $200. www.hdradio.com has a lot of information online. HD radio receivers can also be found on Ebay, and that may be the only way to find them at this point. High end electronics dealers also carry the units for home and car use Car HD radios are also available on line. Make sure you are looking at a home unit or a car unit before purchasing. Ebay listings are not always clear on that issue.